From the National Book Award-winning author of Arctic Dreams, a highly charged, stunningly original work of fiction–a passionate response to the changes shaping our country today. 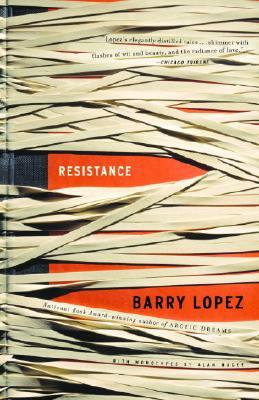 In nine fictional testimonies, men and women who have resisted the mainstream and who are now suddenly “parties of interest” to the government tell their stories.A young woman in Buenos Aires watches bitterly as her family dissolves in betrayal and illness, but chooses to seek a new understanding of compassion rather than revenge. A carpenter traveling in India changes his life when he explodes in an act of violence out of proportion to its cause. The beginning of the end of a man’s lifelong search for coherence is sparked by a Montana grizzly. A man blinded in the war in Vietnam wrestles with the implications of his actions as a soldier–and with innocence, both lost and regained.Punctuated with haunting images by acclaimed artist Alan Magee, Resistance is powerful fiction with enormous significance for our times. Barry Lopez is the author of eight previous works of fiction and six works of nonfiction. His stories and essays appear regularly in Harper’s, The Paris Review, Orion, and the Georgia Review. In addition to the National Book Award, he is the recipient of an Award in Literature from the American Academy of Arts and Letters, as well as fellowships from the Guggenheim, Lannan, and National Science foundations. He lives in western Oregon.